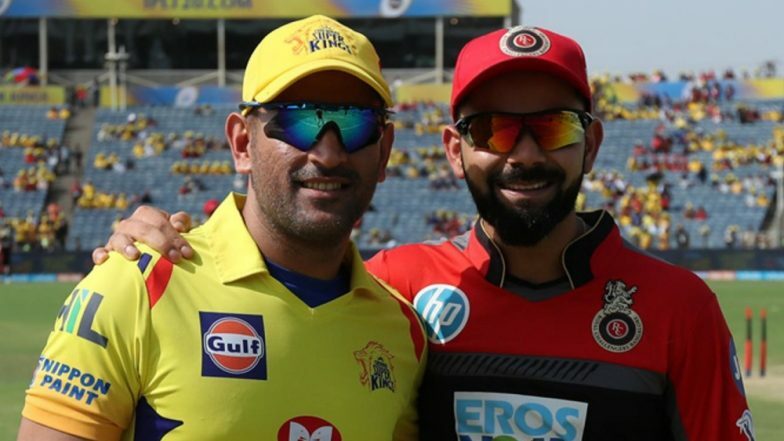 The opening game of the Indian Premier League 2019, will be held between MS Dhoni’s Chennai Super Kings and Virat Kohli’s Royal Challengers Bangalore. The derby clash will be awaited by fans across the country as the two cricketing greats will lock horns against each other in Chennai. The mouth-watering clash is scheduled to take place on March 23, 2019. Getting into the details of the match one, the head-to-head record between both teams suggests that the Yellow Army dominates Kohli’s Royal Challengers Bangalore. Sunil Chhetri Joins Virat Kohli & Co for RCB’s Training Camp Ahead of Their First Game Against CSK in IPL 2019 (Watch Video). The teams have met each other on 23 occasions out of which MS Dhoni’s men have won 15 games and RCB has won seven. One of them produced no result. Out of the seven matches played in Chennai, the hosts have dominated Virat Kohli’s side six times. RCB could win only once in Chennai. However, Virat Kohli’s men have a little better record in Bengaluru. Out of the eight games played between CSK and RCB in Bengaluru, four have been won by Dhoni’s men and three by the hosts. One match could not produce a result. IPL 2019 Schedule in PDF for All Matches: Download VIVO Indian Premier League 12 Full Timetable With Fixtures, Dates, Team and Venue Details. Even at the neutral venues, CSK continues to outweigh RCB. Having played eight games, CSK has won 5 and the remaining were won by RCB. Last year in the IPL 2018, Virat Kohli lost both home and away game against Chennai Super Kings. Talking about RCB, the team has players like Virat Kohli, AB de Villiers, Shimron Hetmyer, Heinrich Klaasen and Marcus Stoinis. Whereas, CSK boasts of players like Suresh Raina, MS Dhoni, Kedar Jadhav, Harbhajan Singh, Ravindra Jadeja and a few others.